Last Saturday Aaron finished work as the boss suddenly appeared and told him it was time to close (no warning, we'd been trying to guess when it would be!) The boys and I had been at a party and came home to find Aaron on the balcony, with a scotch and coke and a big smile on his face. 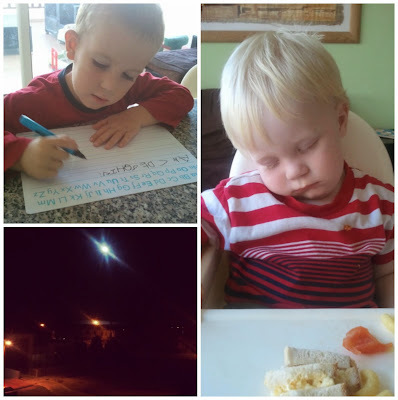 My 'job' was easier (and yet often harder) than Aaron's job, both 7 days a week with no breaks. (although to be fair, I probably managed a few!) and the pay was rubbish for both but we powered on through the season and have just about come out of it unscathed - nothing that a whole lot of sleep won't cure. Back in April we had a great day out at Cyherbia when they held an Easter egg hunt in the maze so I was quite excited when they started advertising a Halloween event for last weekend. We went on the Sunday, getting there just after 10am in anticipation of the crowds the event was inevitably going to attract. The entrance fee was €6 for adults and children with under 3's going free and included games, a cup of witches brew and a lucky dip prize for each child. On entrance each child was given a clipboard with various things to do during the day, in the 'haunted maze' there was the Mystery of the Clocks - you had to find the hidden clocks in the maze and decipher the code. Recently at a Kids Fun Day held at a local Garden Centre we discovered Banbao bricks. They had a display of some of their sets to buy but also a table set up with various sets for the children to play with. Leo was really taken by them and did well putting them together considering he has only owned big 'Mega Blocks' before. He was fascinated by the Double Bus set. I was really impressed with the range of sets on offer, and more importantly (especially for Cyprus!) was impressed at the prices. They range in price from just €1.25 making them ideal for presents or even an occasional treat, so I didn't mind when Leo asked to put them on his 'note for Santa'. 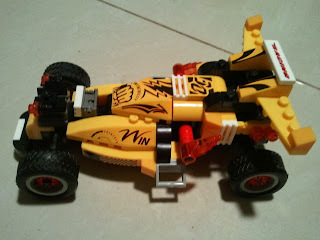 After meeting with them we were given the chance to review one of their top selling items, the Banbao Invincibility Car Racer. 285 - Leo loves 'Jake and the Neverland Pirates at the moment so when invited to a 'Pirates and Princesses' party I raided his wardrobe and came up with this creation, he loved it! I also dressed Louka as 'Cubby' and myself as 'Izzy'! 287 - Not the best photo, but I realised it was the only one I took all day! 288 - Swingball - a bargain buy from the market and a whole lot of laughs as Leo kept getting hit in the side of the head with the ball, luckily he found it quite funny! 290 - One of those 'late night 'I forgot to take any photos' type photo today - my week old birthday balloons. 278 - Now the season is coming to an end and things are quieting down, Aaron took Leo to work with him so he could help out. Leo had a brilliant day and helped wash all the vehicles and got to ride on them. 279 - Another gorgeous Cyprus sunrise, I just can't help but take a photo! 280 - Not sure how this can be a comfortable position to watch tv in but Leo was like this for ages! 281 - Leo really likes my Mum's new rug! 274 - Cooler and sometimes darker mornings now on the school run. Leo actually asked to wear a coat today - never mind that the temperature was 30 degrees just an hour or so later! 275 - Louka was more interested in taking the crayons out of the pack and putting them back than doing any colouring! 276 - Painting a tree, we drew round his hand and arm and he painted that brown for the tree trunk. I suggested the colours for the leaves and he wanted blue - I questioned the choice and he sighed and said 'Stop telling me what to do all the time'! Blue leaves it was then! 277 - Not the best photo by far but I love it as it was taken at our friends wedding. It's been a long time since Aaron and I have been out and it was lovely to see so many people we've not seen for ages. Way back in my early Slimming World days someone in my group reached their target and I heard someone say 'This is the hard bit now, staying there'. I've heard it said many times since and I always thought it a stupid statement, how can staying the same weight (or maybe losing a 1lb or 2) be harder than losing 4 stone or whatever you had to lose to get there?? I hate to agree but I kind of see what they meant now! I reached my target, (well a target, ideally I'd like it 1/2 stone lower) at the start of the summer. I stopped going to group but somehow managed to stay within the target range (3lb above or below the actual target weight) for almost 10 weeks. In the last couple of weeks before returning to group it all seemed to catch up with me and when I weighed last week I had put on 6lb, putting me 4lb over target. This gave me one week to lose at least 1lb or I would have to start paying to attend group again. 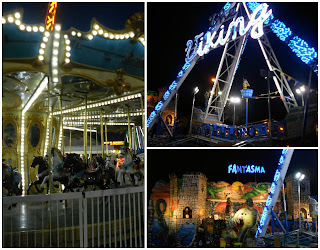 Earlier this year Leo noticed Parko Palitso, the Luna Park / Fun Fair in Agia Napa for the first time, and had been asking to go every time we drove by it for weeks now. It's taken him a while to ask, considering we've been there to the indoor soft play area several times, and he never seemed to notice all the rides we walked past to get there! Having never taken him to a fun fair before I think I may have been almost as excited about it as he was! The park doesn't open until 6pm, including the soft play area - a fact which annoys me (especially the soft play bit!) but I guess holiday makers prefer to spend their days at the beach. Entry to the park is free and you buy tokens or a wristband for the rides, which is handy if you have people in the group who don't intend to go on anything.